Remittances from overseas Pakistanis rose 32 per cent year-over-year to $3.1 billion for the first four months of fiscal 2009/10, according to the State Bank of Pakistan. The central bank expects over $8.5 billion this year in remittances in documented remittances from about 7 million Pakistanis abroad, equivalent to about 5 per cent of Pakistan's gross domestic product. “It is important. That is the size of our current account gap,” State Bank of Pakistan Governor Salim Raza told the News. Pakistan is among the top ten destination countries receiving foreign remittances. Some estimates indicate the formal remittances account for less than half of the actual amount sent to Pakistan. Finance Minister Shaukat Tarin has said that increasing remittances from Pakistani diaspora is the best way to "get rid of dependence" on international lenders. "International financial institutions lend us with strings attached. We can say goodbye to them." The government has launched Pakistan Remittance Initiative (PRI) to bring about a fundamental change in the remittance regime and double the volume of transfers in five years. The effort is aimed at encouraging remitters to use the country’s banking channel by streamlining this process to overshadow the illegal hawala system commonly preferred for being cheap and speedy. Now five banks will transfer wired amounts in the account of the receiver within 24 hours. In March this year, Dr. Farooq Sattar, Federal Minister for Overseas Pakistanis talked about an ambitious target of $15 billion in remittances in 2009-10 while speaking to the media at the launch of a Western Union book titled "Marhaba Musafir". The book contains the basic information about the various countries where Western Union's has operations. 1. Unlike foreign aid, the remittance money from overseas Pakistanis comes with no strings attached. These dollars do not serve the geopolitical interests of any foreign power. Nor are the funds used to pay for unnecessary imports or to pay expensive foreign consultants and contractors from donor countries. 2. While foreign assistance dollars are funneled through the government, the bulk of the remittance money goes directly to the people and it does not feed graft which siphons money into foreign bank accounts of corrupt politicians and bureaucrats. 3. The remittance money has a significant stimulus effect on Pakistan's economy. It invigorates the local economy because it is spent by the people to buy mostly domestic products and services that create more jobs which support more local consumption, and create even more employment opportunities. In the United States for example, most of the food aid, including the additional $770m food aid last year, for the poor countries requires the aid recipients to purchase food from the US agribusiness. These funds do not help the farmers in the poor nations grow food for the countries to become less dependent on foreign help. The US farm lobby continues to flex its muscle and enrich itself, without regard for the severity of the hunger crisis in the poor nations resulting from sharp increase in food prices. Three years ago, farmers and their allies in Congress effectively destroyed an effort by the Bush administration to begin the switch to untied food aid. The current composition of US Congress is no different, as far as the overwhelming power of the farm lobby is concerned. European governments switched to giving all-cash donations for food in the mid-1990s, arguing that cash allows more flexibility in responding to crises and that the U.S. uses its food aid as a form of farm subsidy. But the Europeans also continue to erect various barriers to food imports from poor nations that could improve the viability of agriculture in many Asian and African countries. 1. 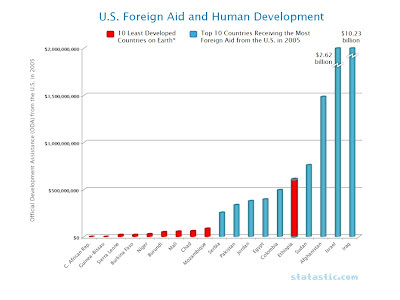 Less than half of aid from the United States goes to the poorest countries. 2. The largest recipients are strategic allies such as Egypt, Israel, Russia, Pakistan, Afghanistan and Iraq. 3. Israel is the richest country to receive the highest per capita U.S. assistance ($77 per Israeli compared to $3 per person in poor countries). 4. Even after the tripling of the US aid to $1.5 billion a year to Pakistan under Kerry-Lugar bill, it still amounts to about $8 per Pakistani. According to Asia Times, last year only five of the 22 countries considered industrialized - Norway, Denmark, the Netherlands, Luxembourg and Sweden - achieved the donor benchmark of allocating 0.7% of GNP to ODA. The benchmark was adopted at the Earth Summit in Rio de Janeiro in 1992 under the UN Agenda 21 program for eradicating poverty through development assistance. No other countries have even come close to meeting the target. France managed 0.41% of GNP last year, the United Kingdom 0.34%, Germany 0.28%, Canada 0.26%, Spain 0.25% and Australia 0.25%. Japan, the only Asian participant, came in a lowly 19th with a paltry 0.2%, maintaining a reduced ODA commitment that dates back to 2001. She goes on to say, "Giving alms to Africa remains one of the biggest ideas of our time -- millions march for it, governments are judged by it, celebrities proselytize the need for it. Calls for more aid to Africa are growing louder, with advocates pushing for doubling the roughly $50 billion of international assistance that already goes to Africa each year. Last year, remittances to various other Asian countries were as follows: $8.9 billion for Bangladesh, $27 billion for China, $30 billion for India, $6.5 billion for Indonesia, $2.2 billion for Nepal, $1.8 billion for Malaysia, $16.4 billion for the Philippines, $2.7 billion for Sri Lanka, $5.5 billion for Vietnam and $1.8 billion for Thailand, according to International Labor Organization estimates. While recognizing that there is no one silver bullet to alleviate poverty, microfinancing, along with social entrepreneurship, is becoming an essential component of non-government efforts in Pakistan and other developing nations to empower ordinary people toward self-reliance by lifting them out of poverty and teaching them the right skills to help themselves. “Give a man a fish and you feed him for a day. Teach a man to fish and you feed him for a lifetime.” This proverb has guided the efforts of late Dr. Akhtar Hameed Khan, acclaimed Pakistani social scientist and founder of Orangi Pilot Project. Supported by private foundations working in Pakistan, all efforts at alleviating poverty should be guided by this proverb that captures the essence of self-reliance. The foreign remittances from overseas Pakistanis and private efforts are clearly helpful to the poor in the short to medium term. However, it is extremely important to recognize that the remittances alone are not sufficient for long-term economic progress based on the much needed human development that translates into a highly productive work force contributing to a vibrant national economy. It is absolutely necessary for the Pakistani state to make significant public investments in education, healthcare, infrastructure development and pursuit of good policies and competent governance in the country. Remittances aren't really very useful from a long term economic perspective.Yes they do increase consumption at home but create prctically no long lasting benefits in the country except ofcourse to the immediate kith and kin. Instead of remittances(which will happen anyway cause people have responsibilities at home) the government should focus on getting its oversease citizens to invest inside their economy and return to their countries with the skills and knowledge acquired abroad. That will have a much longer lasting impact than a few dollars trickling in from here and there. Anon: I agree that remittances are not a substitute for public investments in human development and infrastructure for long-term benefits to the nation.